I stood on the sidewalk with my fiancé in front of a Redbox movie rental machine outside a Walgreens store this past Saturday evening around 9 pm March 24, 2012. As we were browsing through the movie selections, one I had never heard of before caught my eye entitled Take Shelter. It was little known and rated R for strong language, so we had our reservations about watching it – it could have easily been a bomb! – but after scrolling through many more titles, I just couldn’t resist the urge to get that movie. A foreboding feel was evident immediately, even from the ominous keyboard music playing during the movie’s main menu. A family man, Curtis, started having bad dreams and visionary signs of a terrifying apocalyptic-sized storm coming. The apparitions would occur even while he was around other people, but no one else ever heard or saw what he did. Thinking he might be going crazy, Curtis sought mental help. However, he just couldn’t shake the dreadful feeling, nor the recurring dreams and signs, so he began building a massive storm shelter in his back yard to save his family. I remember saying to my honey, “I hope this movie ends with an actual storm, so we know he wasn’t crazy after all.” Well, sure enough, the final scene came … playing in the sand on the beach with his deaf daughter, Curtis watches her stand up straight with a concerned look on her face, gazing out behind him towards the ocean and hand motioning the swirling sign for “storm”. His wife nodded in approval. They all saw it! Then with the terrifying storm in view, a thunder strike is heard and the movie abruptly ends. Here’s where the miracle happened! After several minutes of credits rolling, I looked down at the DVD player and noticed the clock-counter read: 1 hour, 59 minutes, and counting! I calmly said, “Look at the DVD player, honey (knowing in my heart it was going to end at exactly 2 hours and 00 minutes).” Sure enough, at exactly 2 hours, 00 minutes, and 57 seconds the movie ended and returned to the main menu! Do you understand? It’s the title of my (really God's) book! It's confirmation again of the prophetic message He has given me to proclaim to the world: Exactly 2,000 years after the year of Jesus’ death on the cross the fiery global apocalyptical storm will be here, with the rapturous return of Jesus Christ! Friend, no matter where I am or what I am doing, God will not leave me alone with this message! I cannot shake it! You can think I’m crazy. You can think I’ve flown over the cuckoo’s nest. You can roll your eyes when you read my words. You can mutter your displeasure under your breath when you see me. You can run, hide, ignore … do whatever you want to! But none of that will change the fact that I’ve been sent by God to warn you, "There’s a storm coming, and it’s like nothing you’ve ever seen, so you better Take Shelter!" Watch Take Shelter Trailer HERE. Read Take Shelter Wikipedia entry HERE. Approximately 858 Weeks (Sabbaths) Remaining Till Christ's Return! I woke up at 3am on the Sunday morning of September 23, 2007 with a tremendous urge to turn on the TV. When I did, there was the evangelist Perry Stone beginning a program about a man I had never heard of before named William Branham. 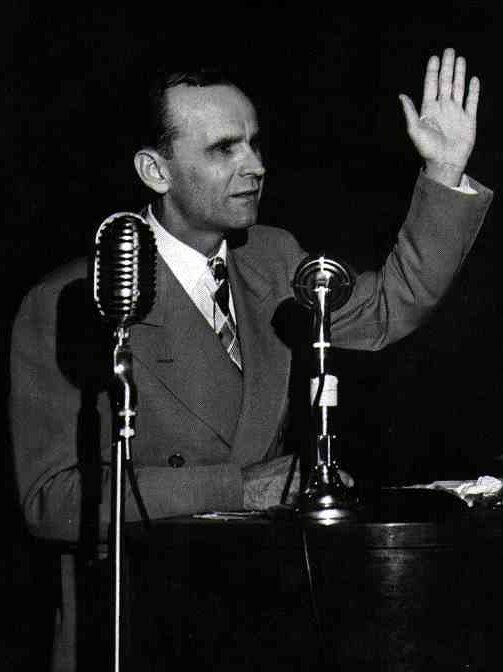 In 1933 – six years before WWII began – William Branham had received a vision of 7 future events to transpire in the world. The first five have happened exactly as he saw them, and I have reason to believe the last two will as well! I want to share this revelation with you today. The Italian fascist dictator Benito Mussolini will invade Ethiopia and later come to a shameful demise. Adolph Hitler will start a war (WWII) and later come to a mysterious end. Fascism & Nazism will be swallowed up by Communism, and Russia will emerge from the U.S.S.R.
After the war (WWII) Science and technology will advance tremendously; cars will be shaped like eggs and will be able to steer with no driver. America’s morals will decline considerably; women will undress to the point where they will be wearing a string. A beautiful but cruel woman will rise to power in America. America will be reduced to a burning smoldering mass of craters and smoke. Now listen, I don’t know much about William Branham or his ministry, but I do know what God revealed to me in His Word in AD 2008 (around 6 months AFTER He brought the above prophetic information to my attention!) which amounts to this … in about 16 years the ENTIRE planet Earth will be a burning smoldering mass of craters and smoke, which will obviously include America. Thus, I can easily see the coming fulfillment of William Branham’s final vision! This leaves about 16 years left for a woman to rise to power in America first, possible becoming our president. Keep your eyes open! Approximately 859 Weeks (Sabbaths) Remaining Till Christ's Return! Since I spoke last week of the 12th century AD seer Saint Malachy and the possible fulfillment of his intriguing “112 prophecies of the popes” vision, I thought I'd stay in the same vein this week and speak about another world famous seer – Nostradamus. Michel de Nostredame was a 16th century AD Frenchman who wrote his prophecies in the form of 4 line verses known as Quatrains. 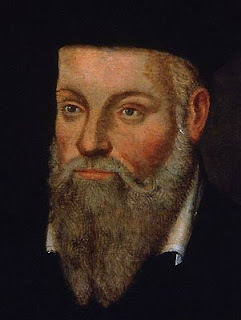 Now, do I believe Nostradamus (Latinized name) was a true prophet of God? Not really, for he wouldn’t even acknowledge that fact himself. There’s talk he may have plagiarized his prognostications from other men. For all I know, he may have even been under the influence of Satan! (Satan and his demons know some things about the future and how this “Game of Life” will end too, you know.) But listen, none of that is the point here … I’m writing this blog to simply make you aware of the existence of one of Nostradamus’ well-known Quatrains that fascinates me now because of its seemingly amazing correlation with the stunning prophetic truths God revealed to me in His Word back in AD 2008 concerning Jesus Christ’s Second Coming. It is not hard to recognize Nostradamus describing Biblical prophesied events of Christ’s return in these words – the King of Kings (Terror) coming in the clouds (sky), before and after war (Mars), to reign forever in righteousness (good luck), judging a world of ungodly beast-marked people who have forgotten him (tired of him) who were deceived by the False Prophet (clergy outh-taker disloyal), while the righteous rise out of their graves to meet him in the air (buried will go out from their tombs). But what fascinates me even more about these Quatrains is Nostradamus’ attempt to prophesy the “TIME” of these events by including this: “The year 1999, and seven month” and “The year of the great seventh number accomplished”. Now that amazes me!!! Here’s why … because in AD 2008 God clearly revealed to me in His Word where He had secretly prophesied His son, the Messiah Jesus Christ, would DIE during Earth’s 4,000 year and would RETURN during its 6,000 year. In other words, Jesus Christ will return to planet Earth 2,000 years after the year of his death! In addition, the start of the seventh lunar month on the Jewish calendar is the Feast of Trumpets, which is CERTAINLY the “time” DURING A YEAR when Christ’s Second Coming will occur! So was Nostradamus trying to tell us all of this clandestinely by writing, the "King of Terror" will come “The year 1999, and seven month”? Aforementioned aside, it does appear Nostradamus knew and understood God’s 7 Day (7,000 solar year) master time plan for Earth – which has always foretold (even since God’s 7 day Creation!) when six full millennial ages of time have passed on Earth (year 6,000 arrives) – “the year of the great seventh number accomplished (having arrived)” – Jesus Christ will return gloriously in the clouds to judge the living and the dead, rapturing the righteous safely into the air, while burning the flesh of the ungodly and the entire surface of planet Earth with fire; only to then set up his beautiful, blessed, peaceful and holy millennial Sabbath Kingdom on Earth – “the great millennial age” – where the righteous will dwell with him forever! Come quickly Lord Jesus. Watch video "Jesus Christ Will Return to Planet Earth Around AD 2028!!!" Approximately 860 Weeks (Sabbaths) Remaining Till Christ's Return! In the 12th century AD, a catholic seer named St. Malachy had a vision of all the remaining pontiffs to come until the “end” of this age of sin. He uttered 111 short Latin phrases, each of which gave secret clues into the identity of the 111 popes to come; and then he spoke one final chilling doomsday prophecy concerning the time of the last pope, or the 112th pontiff: “During the final persecution the seat of the holy roman church will be occupied by Peter the Roman, who will feed the sheep in many tribulations, after which the seven hilled city will be destroyed, and the terrible Judge will judge His people … THE END” This prophecy appears to be referring to the time of the Antichrist (when the whole world will endure Great Tribulation for 3½ years), and since the city of Rome (where the Vatican stands) is known as the city on seven hills, it appears to be aligning with Revelation chapter 17 & 18 where the destruction of the seven hilled city is foretold to occur right before the final battle of Armageddon. So where are we today on this list of 111 pontiffs? The current pope Joseph Ratzinger is number 111 !!! Pope John Paul II was number 110. What was St. Malachy’s prophecy about the 110th pope? It was “De labore solis” meaning: the sun’s eclipse, or the sun’s labor. John Paul II was the only pontiff on the list who was born on an eclipse and later entombed during an eclipse! And what is St. Malachy’s prophecy about the 111th pope? It is “Gloria olivae” meaning: the glory of the olive. Aware of St. Malachy’s prophecy, the cardinals tried hard in AD 2005 to not pick a pontiff having anything to do with an olive, but what they couldn’t control was the name he would choose to rule under. And what did Ratzinger pick? He chose Benedict XVI. And what is the symbol of the Benedictine order? You guessed it … the OLIVE! So here’s the deal … I’m not saying St. Malachy’s prophecy is absolute truth, although it seems to be shaping up that way. But what I am doing is making you aware of this intriguing prophecy, so you can keep watch! John Paul II had ruled for 27 years when he died in AD 2005 at 84 years of age. 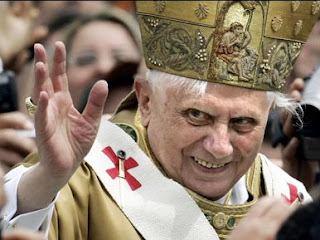 Benedict XVI has now ruled for 7 years, and he turns 85 years old April 16, AD 2012! There is talk of his strength subsiding, and even talk of him possibly resigning if he can’t fulfill his duties. So how much longer will he live? I don’t know. What I do know is what God has told me … the “end” of this age of sin (or Earth’s 6,000 year!) is still about 16 years away. Therefore, it seems to be shaping up quite nicely for one final pontiff (Peter the Roman) to reign, don’t you think? Watch "The prediction of the last pope to come before the Antichrist" video HERE. Approximately 861 Weeks (Sabbaths) Remaining Till Christ's Return! Our beloved Apostle Paul wrote something about himself and his beliefs in one of his letters that is a dagger (death blow) to the heart of ALL incorrect doctrine concerning salvation (how one obtains eternal life). But here’s the shocking and mind-boggling irony of it all … the incorrect salvation doctrine is being formulated from words out of PAUL’S LETTERS! Do you understand? IT’S THE SAME MAN !!! 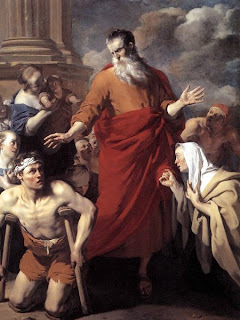 In other words, like I spoke about last week – read blog here – people our misconstruing Paul’s words, twisting them around to mean something other than what he actually meant. How terrible. How tragic. So what did Paul write? Listen to him carefully: “I keep under my body, and bring it into subjection: lest that by any means, when I have preached to others, I MYSELF SHOULD BE CASTAWAY” (I Corinthians 9:27). Oh, my! The English word “castaway” was translated from the Greek word “adokimos” meaning: failing the test, rejected. This was no doubt a throwback to the words Paul heard Jesus had spoken about the Day of Judgment, when the damned will hear: “DEPART (CASTAWAY) FROM ME, all ye workers of iniquity” (Luke 13:27). Can you imagine? Paul feared he could end up in hell!!! Did Paul believe (mentally acknowledge) Jesus died on the cross for his and all mankind’s sins? OF COURSE HE DID!!! He lived on Earth when Christ lived on Earth; he talked extensively with Christ’s disciples; he knew everything about Christ’s life and believed it was ALL true! So was that ever going to change in his mind? OF COURSE NOT!!! Furthermore, Paul spent his days preaching about Christ to others! And YET, he STILL feared he could end up in hell. So what is it? What MUST a person REALLY DO to obtain eternal life? What did Paul HONESTLY believe (deep down inside his heart) about the subject? You who like to tilt your chin back and puff your chest out, who only know how to continually parrot a few trite words from Paul’s letters – taken horribly out of context! – “Saved by grace … not of works!” Really!!!??? So tell me again why you believe you’re going to heaven? Because you believe (mentally acknowledge) Jesus died on a cross for your sins? REALLY!!!??? And you got that understanding out of Paul’s letters? The one who mentally understood Jesus was the savior of the world better than you do, yet still feared he could end up in hell! You've been once saved always saved? REALLY!!!??? And you came to that understanding out of Paul's letters? Well, then you better go straighten him out on the meaning of his own words, because he still feared he could end up in hell! LOL So you don’t have to do ANYTHING (no works of love!) to obtain eternal life? REALLY!!!??? And you got that understanding from Paul’s words, too? The one who gave up his life to be an itinerant preacher, yet still feared he could end up in hell! Do you see the irony? If you are one of the those whose salvation doctrine only consists of a few misinterpreted words out of Paul's letters like “Saved by grace … not of works!” … you are dreadfully mistaken! Without a doubt, you are confused about the truth of God’s Word concerning salvation (how one obtains eternal life). And yes, you are deceived about the Apostle Paul’s beliefs on the issue, too! It is your pride and sinful lusts (willful disobedience to God's 10 love commandments) that keep you holding onto these demonic lies. But I have been sent to warn you today, “Wise up! Soften your heart! And turn from your wicked (non-loving) ways before the last breath of air rattles out of your lungs." Visit UBP Book Website HERE. Approximately 862 Weeks (Sabbaths) Remaining Till Christ's Return!